Rep. Frank Wolf (R., Va.) said Tuesday he is "deeply concerned" that DEA Administrator Michele Leonhart is being pressured to fall in line with the Obama administration’s political positions, despite conflicts with federal law. The Huffington Post reported Friday that U.S. Attorney General Eric Holder brought Leonhart in for a conversation following congressional testimony she gave that raised concerns within the Justice Department about whether she was appropriately in line with the administration’s stances on marijuana and sentencing reform. Wolf, the chairman of the appropriations subcommittee that funds the Justice Department, criticized in a letter released Tuesday what he called political pressure from the Obama administration against one of the nation’s top law enforcement officials. "Having served in the Nixon Administration, I am well aware of how the political leadership of an administration can try to politicize the civil service, including law enforcement," Wolf wrote. "This article suggests a similar ‘Nixonian’ effort to pressure a career law enforcement leader into changing her congressional testimony and public comments to fit the narrative of the administration." In recent months, Leonhart and other top DEA officials have spoken out against the administration’s decisions to not block marijuana legalization in Colorado and Washington, as well as ease prosecutions of some drug offenses. Testifying before Congress earlier this year, Leonhart told Wolf that her agents’ resolve is only stiffened by the increasing acceptance of marijuana. "Our agents are fighting back against those messages," Leonhart said. "Actually, it makes us fight harder." At another congressional hearing in March, Thomas Harrigan, the DEA’s deputy administrator, testified that legalizing marijuana "insults our common values." "We also know that marijuana destroys lives and families, undermines our economy, and insults our common values," Harrigan said. "There are no sound scientific, economic or social reasons to change our nation's marijuana policies. We must send a clear message to the American people and ensure our public safety by not abandoning science and fact in favor of public opinion." At an annual meeting of sheriffs earlier this year, Leonhart openly criticized Obama for comparing marijuana to alcohol. Most recently, Leonhart appeared to support current mandatory minimum sentencing guidelines at a Senate Judiciary Committee hearing. 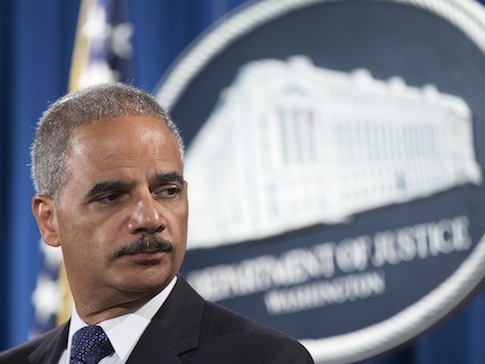 Holder has made sentencing reform one of his top priorities. It was that conflict, according to the Huffington Post, that led Holder to meet with Leonhart. "It is important that you send a clear signal to Justice Department staff, both political appointees and career civil servants, that public intimidation like this leak will not be tolerated," Wolf wrote. This entry was posted in Politics and tagged Barack Obama, Department of Justice, Eric Holder, Frank Wolf, Obama Administration, White House. Bookmark the permalink.